Now in an industry where there is now a wide variety of studios with a wide variety of equipment, styles of engineering and prices. Finding the right fit for you or your band can be quite a daunting task. If you choose to book a studio instead of going down the DIY route, there are some things you can do. Hitting the Internet is an obvious starting point. Find studios or engineers that specialise in your genre of music. 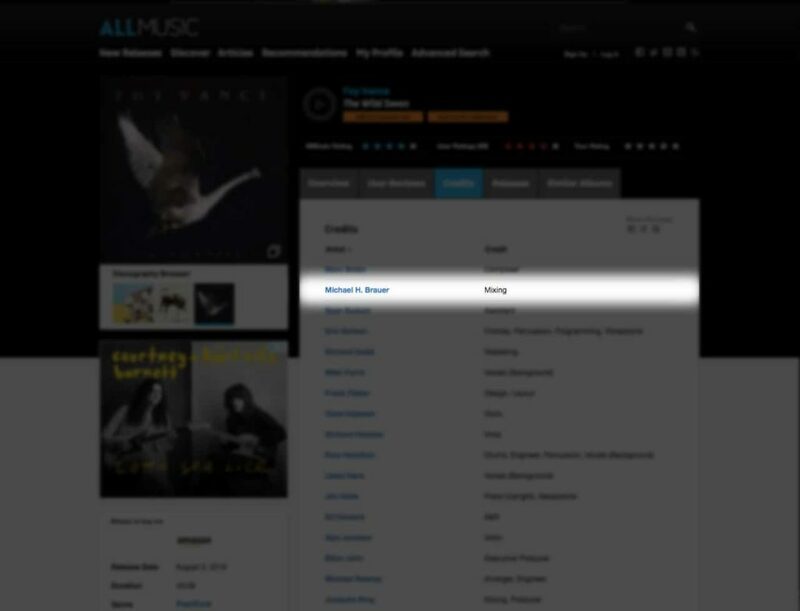 Listen to their work and find other artists who have worked with them. Reach out to them to ask what their experience with that studio or engineer was (Google reviews will also help you here). Get as much information as you can before making your decision. This will save you a lot of headaches later down the line. Most importantly, consider your budget. What are the payment terms? How will you be paying for the services of the studio you are using? Ask in advance. Finding out who engineered/mixed/mastered your favourite albums might point you in the right direction of which person to hire.  On that note, also consider the media triangle. Labeled as follows; Time, Budget and Quality. If you shorten or lengthen any one of those sides the other two will shorten or lengthen with it. For example, if you give a studio less time to do their job, yes it will also cost you less but the quality will also go down. The opposite also being true where the longer you give a studio the more it will cost you but the quality will go up. Unless you are made of money you’ll more than likely have to settle with two of the above. So, you’ve chosen your studio and booked some time to lay it all down. Your next step should be getting as much focused rehearsal time in to maximize the amount of time you have in the studio. There is one thing that will annoy your engineer and that is writing in the studio. Make sure that the songs are well structured and everyone knows exactly what everyone else is doing. I have had numerous “oh is that what you’re playing?… well that’s not right” moments in the studio and nothing eats up more time than fixing/ learning parts that have not been rehearsed properly. I find that sometimes writing tabs, lead sheets or music out also really helps people get to know their parts. Do this if you can and bring copies for your engineer. Some of the best sessions I have worked on have been ones where the bands have handed me music to read so I also know what part is being played and how it should be performed. It makes life a lot easier. I would also establish who is going to be tracking what part. I know this is going to be a controversial opinion but the point of recording is that the end result sounds good. I’ve had numerous sessions where the guitarist has tracked the bass parts or the keyboard player has played the guitar solos simply because they were getting a better end result. It is better to establish who is doing what in rehearsal than it is to waste time having those debates in the studio when you are on the clock. 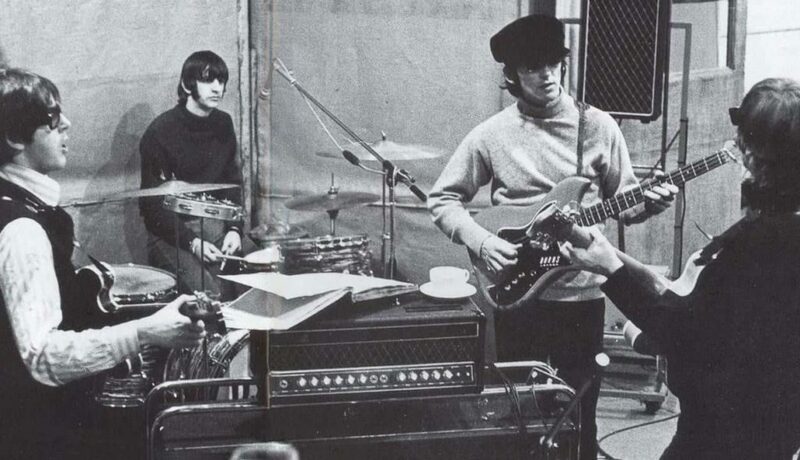 The Beatles rehearsing in 1966 – They recorded some pretty good songs right? OK, so you now know your songs, you’ve established who is performing what parts and now it is time to prepare your productions. This may sound daunting but this is a lot simpler than it sounds. In most productions I consider this the final stage of rehearsal where you plan out your tempo map and if you can, lay down scratch tracks for people to play along to. There are numerous ways to do this and as most people have some form of recording software available to them these days on their computer, tablet or phone this step is fairly easy. First and foremost, unless you are recording live (or in my case even if you are recording live) you will be recording to a click track. 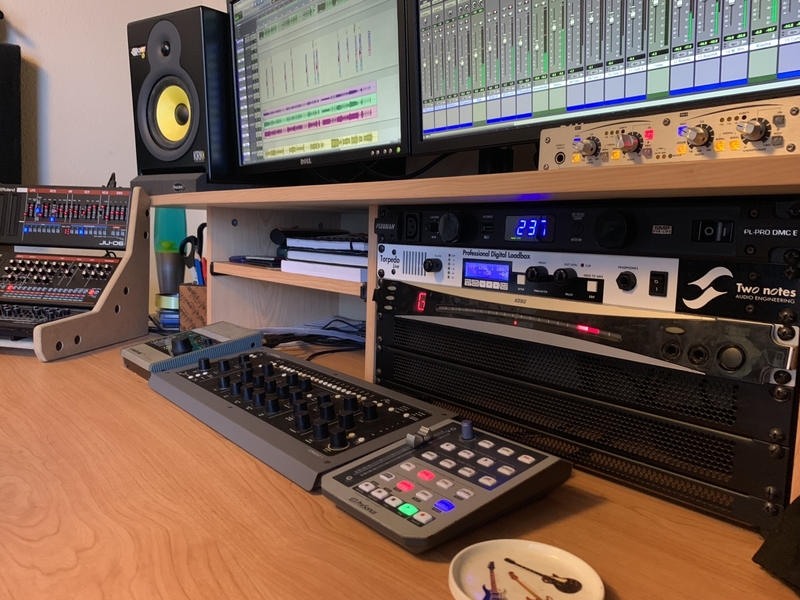 I can’t stress enough that the more you perform to a metronome or click the easier it is and the less time it will take you to record your parts to a professional standard in the studio. So, with that in mind establish what BPM you are playing in, how many bars each BPM is (if you have changing tempos) and in what time signature. Make notes or dial that into your software. Once you have established this, there are two ways you can help your engineer out. Make a document and make notes of your tempos / time signatures for each section or produce a MIDI click with any drum sound firing on each beat and export this for each song to take with you. 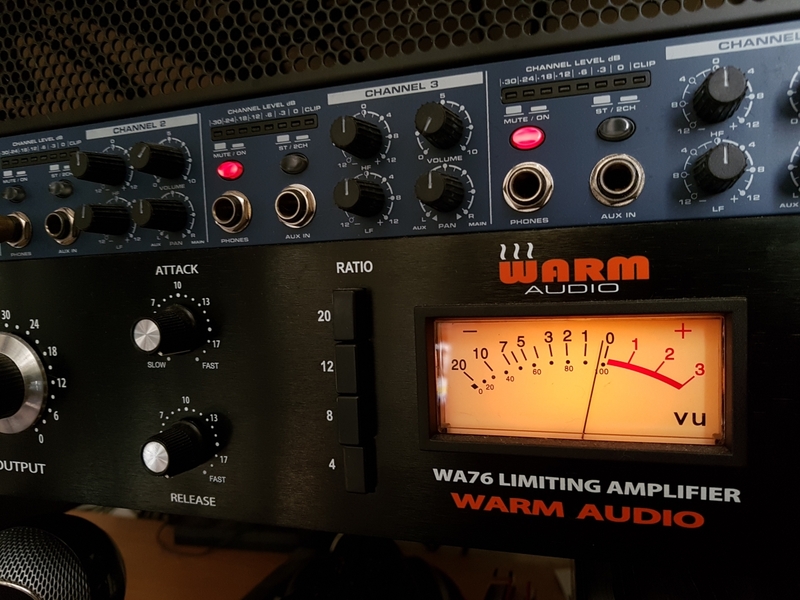 In the studio your engineer will be able to use this information to produce a tempo map in their recording software and you will be good to go. With my freelance work I try and do this step with the band in my home studio so we are all on the same page. Some studios may offer this to you as well so it is best to ask. Secondly, at the very least track a guide guitar or rhythm instrument for the drummer to play to. Doing this in advance will help the drummer perform their parts. As long as the guide part is tracked properly to a click this will help to save you time later. You can do this in the studio but the goal here is to save time. Some productions will track the entire production in a guide form before they hit the studio. Demo the parts out and try ideas out before recording for real. This is nice but not always essential. Whatever you track, make sure you bring them with you to the studio along with your tempo map. On the final rehearsal before tracking, record your songs as a band on one of your phones. Have a record of song structure so the engineer can familiarise themselves with your songs before you start. This will also help you to maximize your time. I find check lists a great way of making sure you don’t forget anything when its time to record. Personally I call them idiot checklists. Nothing is worse than arriving at a session and forgetting an essential piece of equipment. The best attitude to have is to not rely on the studio having everything. Even the most equipped studio could be missing something that you may have forgotten. Make sure you have had your instrument set up by a professional as close to recording as possible. Have you got fresh drum heads, strings and picks etc? Have sorted all of your dodgy cables and connections, have your throat sweets etc. Whatever it is that you need to being, make a list and check it off before loading in. Also, bring spare strings, spare cables, spare picks etc. It will be typical that the one time you do not expect something to break, it will break. Likely, in the middle of your once in a life time take! You cannot be too prepared. 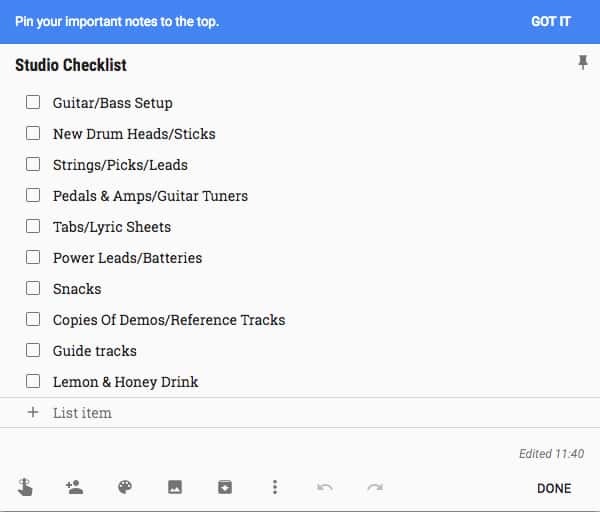 Use Apps like Evernote and Google Keep so you always have your checklist handy. I have had this a few times on sessions. The band will bring in non essential people into the studio to hang around. This could be friends, partners etc. I find that these people generally are a distraction that will cost you time and money in the studio. If the person is not there to record, film, take photos for promotional material, produce or engineer, do not bring them along. That said, at the end of the project, if you want to bring friends along to record gang vocals, hand claps etc or listen to the final mixes this is fine within reason. But please clear it with the engineer first. They may not have the space to accommodate more than the band and one or two other people. The engineer doesn’t look too happy here, does he? Hopefully this has given you a better insight in to how to prepare to record in the studio. Now go out there and make the best music you can!